Several years ago I purchased a Boker Kalashnikov knife. Converted from a manual push button folder into a side open automatic knife, this beauty was the perfect everyday carry knife. I used it hard for six months and then retired it to my wall of knives. After giving it’s all to me for those 180 days, it was time for a rest. Built with a 3 1/4″ blade of AUS8, the knife is about the perfect size for everything that I run into on a daily basis. The blade was easy to keep sharp with my Spyderco Sharpmaker. I had the desert tan model with partial serrations on the blade. The combo edge made it simple to cut straps and rope whenever I needed to–but even better, it made short work of that horrible plastic packaging strap stuff that boxes so often come bound up in. I would just slide my knife under the strap, twist it so the blade was facing up and give it a quick pull/slide across the strap and the straps would slice right off of the box. Of course my Boker Kalashnikov makes short work of opening packages, but really, almost any knife can do that. The real question was, could the knife do more than the average EDC knife. The answer is a resounding YES. One time, and I probably should be ashamed to admit this but I really like to put my knives through the paces to see if they are great or not, I even used my Kalashnikov to help me replace a section of my sprinkler system. I used it to cut funny pipe. I even used it once to cut through a piece of 3/4 pvc pipe because I wanted to see if the knife could do it. It did. I had to saw a bit to get the job done, but the serrations cut right through the pvc pipe and I got the sprinklers all repaired. I don’t suggest you use your knife to do this, but I did and it was tough enough to get the job done. After six months of hard use, my knife was still in surprisingly good shape. The blade had a few scratches across the face–which is to be expected considering how hard I used the knife. The handle had nearly no visible wear and tear. I did have one short scratch on the front side of the handle where I scraped it across a metal bar as I was pulling my hand out of a tight spot where I was using the knife to cut a string that was behind some shelves. The ding is almost not visible unless you know what you are looking for. My review of the Boker Kalashnikov is that it can get nearly any job done. The blade size is plenty big for most jobs and the AUS8 stainless steel is perfect for daily, heavy use. The handle is comfortable and rugged. The knife is nearly indestructible. 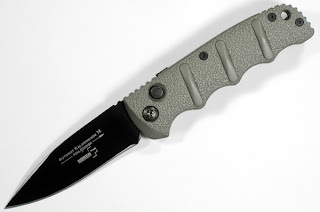 Looking for a great automatic conversion knife–consider the Kalashnikov. Recently, we began discounting several items for our On Sale at BladeOps Category. If you are looking for some great knives at unbeatable prices, check out this category page on our website. We currently have a whole bunch of Boker, Kershaw, Bear Ops, and Browning knives as well as several other great knives.